On your server you should have a script that will actually generate and send e-mails to a certain e-mail address. A sample of this contact.asp script you can download here. The ASP script is supported on the most of Windows-based hosting servers. – “Name” attribute is a value which is used in contact.asp file. If you don’t know these settings, you need to contact your hosting provider for the details. I tried to click on the link to download contact_asp.zip and the page came up with an error. Please let me know how I can download this file. Sorry for the inconveniences. The download link is working fine now. The catchy blog with the interesting posts. You give the nice information that many people don’t know before. most of your contents are make me have more knowledge. it is very different. I was impressed with your blog. Never be bored to visit your blog again. Have the nice day.Keep enjoyed your blogging. Thank you, thank you, thank you! 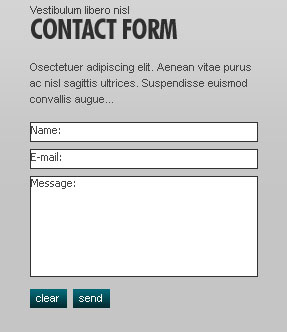 I was looking around what seems like ages for an ASP contact form that I could target for my new company website I built. This works like a charm! The tut would be very helpful too, but I already built the form container. Thanks for everything, appreciate this Blog you have here. Please check the link once again.